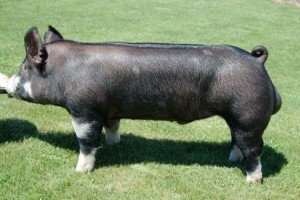 The Berkshire breed originated in England and was brought to America in 1823. The Chester White breed originated in Chester County, Pennsylvania, during the mid-1800s. At first it was called the Chester County White, but later the “county” was dropped. 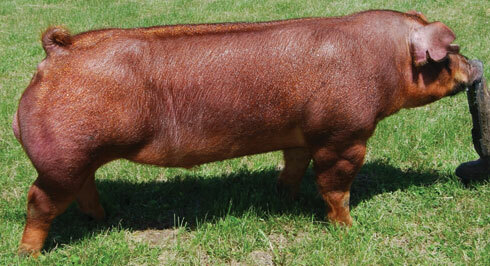 This hog originated in the eastern United States and in the Corn Belt during in the early 1800s. 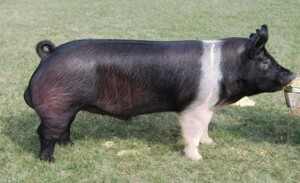 The Hampshire breed originated from the “Old English Breed” which originated in southern Scotland and Northern England. The breed was imported to American between 1825 and 1835. 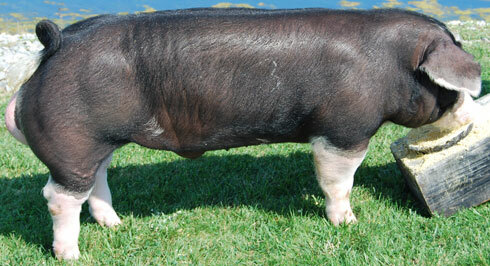 The American Landrace descends from Danish Landrace hogs imported in 1934 by the U.S. Department of Agriculture. The origin of the Poland China breed has its beginning in the Miami Valley, Butler and Warren counties of Ohio during the early 1800s. 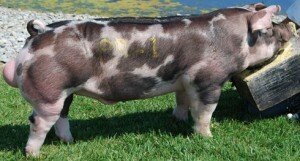 Spots descend from the Spotted hogs which trace a part of their ancestry to the original Poland China. This breed was developed during the late 1800s. The Yorkshire breed was developed in England in the county of York. The first Yorkshires in the United States were brought to Ohio around 1830. 40 million B.C.– Archeologists believe this is when the first pigs appeared on Earth. 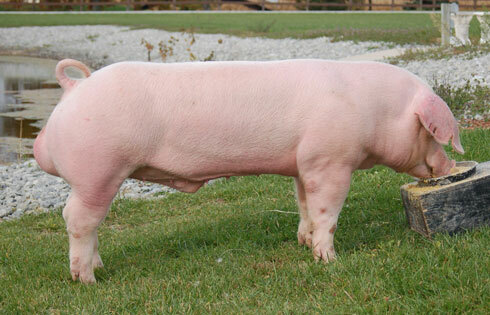 7000 B.C.–The pig was one of the first animals to be domesticated or trained. 4000 B.C.–The Chinese people were ordered to raise and breed hogs by a royal decree from the Emperor of China. And, because the ancient Chinese did not want to be separated from their herds, they would sometimes be buried with them. 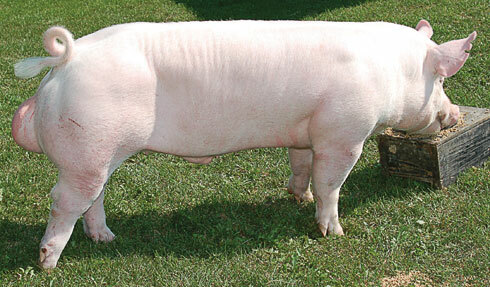 4000-3000 B.C.– Egyptian drawings showed that pigs were prized and eaten only once each year. 1493–On the insistence of Queen Isabella of Spain, Christopher Columbus took eight pigs on his voyage to Cuba in 1493. 1539–Hernando de Soto introduced hogs to North America. He landed with America’s first 15 pigs in Florida. 1760s–George Washington imported special hogs to establish breeding herds. 1863–The city of Cincinnati, Ohio, was nicknamed “Porkopolis,” because it was such a major pork-processing center based on the Ohio River. Cincinnati continues to celebrate its porky heritage with the “Flying Pig” marathon each May. 1933–“Big Bill,” a Poland China hog, was recorded as the heaviest hog in history. He lived in Tennessee and weighed 2,552 pounds and was 9 feet long! 1986–The national advertising campaign, “Pork. The Other White Meat,” was introduced to market pork as lean and nutritious. 1995– The Environmental Assurance Program (EAP) is launched to help producers meet environmental challenges. Today–Pork is the most popular meat in the world. 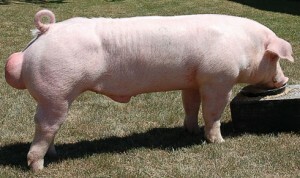 Swine–an omnivorous, even-toed ungulate of the family Suidae. Includes pigs, hogs, and boars, having a stout body with thick skin, a short neck and a movable snout. The amazing utility of the hog has motivated the saying, “We use everything, but the oink.” Thanks to hogs, we have several life-supporting and life-saving products. Swine research led to the development of the CAT scan, a technology for examining internal organs without surgery. Pork fat, especially lard, has a history of being used as a medicine. The lard was combined with herbs as a home remedy for chest congestion. Hogs are powerful resources! All told, pigs are a source of nearly forty drugs and pharmaceuticals! Pig pancreas glands are an important source of insulin hormone used to treat diabetes. Pig insulin is especially important because its chemical structure most nearly resembles that of humans. Specially selected and treated hog skin, because of its similarity to human skin, is used in treating massive burns in humans, injuries that have removed large areas of skin and in healing persistent skin ulcers. Hog heart valves, specially preserved and treated, are surgically implanted in humans to replace heart valves weakened by disease or injury. Since the first operation in 1971, tens of thousands of hog heart valves have been successfully implanted in human recipients of all ages. The pork industry supports more than 800,000 jobs. Pigs do not have sweat glands, so they use water or mud to cool off. The pig is rated the fourth most intelligent animal. On Manhattan Island, a long solid wall was constructed on the northern edge of the colony to control roaming herds of pigs. This area is now known as Wall Street. In ancient Crete, it was the custom for each family to raise a hog to be harvested on Christmas Eve and served the next day. Nearly every part of the pig was consumed, feeding the family for weeks. The bladder was often washed out, cleaned and used as a ball for children’s games. In many cultures, children are given “piggy banks” to encourage them to save their money.